Welcome to the teenage years SimeWorld! How time flies – I remember clearly seeing a certain Ron’s website and being inspired to get my own domain. As I’ve mentioned before, I tend to only keep this domain for e-mail purposes these days, but I can’t imagine a time where there isn’t at least something here as well. So, the last 12 months have been pretty good in general. I’m still in my permanent role in St Helens and I managed to finally get myself a Microsoft qualification, so I am now a Microsoft Certified Professional. Wish I’d done it years ago, but never mind – hopefully just the first qualification of many. Not much change in Joanne’s work situation – technically part-time but with continuing extensions to her hours to top up the money, which is much needed! Matthew did pretty well in his GCSEs and has gone on to study for his A-Levels at Sixth Form. He’s not really certain what he wants to do with regards to a career (I know I certainly didn’t) but he’s leaning towards a Paramedic at the moment. Hard work to get there, and even harder if you get that job, but I wish him all the luck in the world. He already has his provisional driving licence and he will be taking driving lessons from next month. Terrifying how fast the time flies by when you consider that he was 4 years old when I started this website. Our Summer Holiday this year was a long awaited return to Holland, and to a CenterParcs we hadn’t been to before called De Eemhof. It was close enough to Amsterdam for us to spend a day there as well, and our accommodation was a VIP Marina Apartment which was absolutely stunning with a view to die for. I could have stayed there forever just to watch to the sun cross the sky and set with it’s gorgeous reflections glistening across the myriad of boats in the marina. Another year has gone by, and it continues to feel like things are still definitely on the up. I’ve no doubt that the next 12 months will bring their own set of challenges, but it’s good to feel like I have the energy and optimism to face them with a smile on my face and a determined belief that everything is going to be OK.
Here’s to SimeWorld – my baby website turned Teenager. 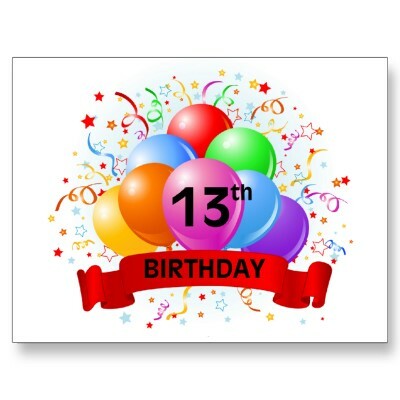 Happy 13th Birthday.